• Plaza 28 de Julio, its main attraction is to know the locomotive Morona Cocha, a legacy of the rubber era, which was inaugurated in 1905, by its owner Mr. Julio Cesar Arana del Águila. It was made up of the Moronococha, Sachachorro, and Punchana machines, which pulled flatbed cars or boxes to transport the packages of import and export merchandise. The locomotive was also used on Sundays and holidays by the public and its route was between the streets Omagua (today San Martín) and Jirón Lima (today Prospero). • Mercado de Belén, its main attraction is the Paquito Passage known as the natural pharmacy of the Amazon where we will find the great variety of medicinal plants and special preparations used ancestrally by the Amazonian people. 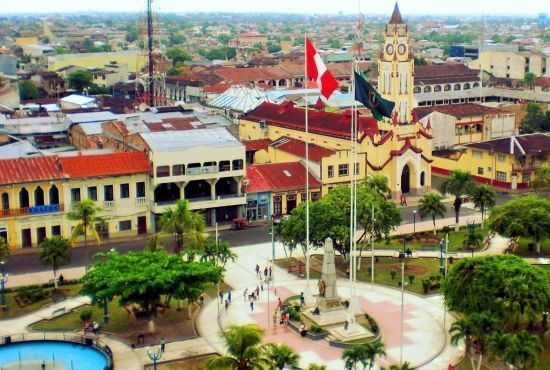 • Tarapaca and Boulevard Malecón, the main attraction is the former Hotel Palace, considered the largest arquiitectonic jewel of the City of Iquitos, its construction began in 1908 and was inaugurated on June 10, 1912, it has an eclectic architectural style. Those responsible for its construction and emebellecemiento were the engineer Samuel Young and the Spanish builder José Atimira and to date you can see a hall, its beautiful tiles and wrought iron that were brought from Europe. • Boat Museum Ayapua, on the way to the museum we will know part of the Boulevard and the Church of Consolation, occasion to take pictures. We will also know Casa Morey, its first owner was the rubber tapper Luis F.Morey. The Ayapua Ship was built in Hamburg, Germany (1906) and houses an interesting sample of the beginnings of Iquitos.